The tomb of one of the most famous emperors in Chinese history was discovered on Sunday at a construction site in Yangzhou, Jiangsu province, while a fake burial site has been a tourist attraction for many years. 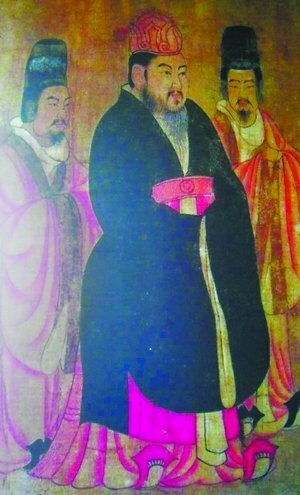 Archeologists from all over the country rushed to Yangzhou and confirmed that the tomb found in Xihu township of Hanjiang district belonged to Yang Guang, who is considered to be one of the worst tyrants in Chinese history. Generally, Chinese historians say Yang's tyranny brought the Sui Dynasty (AD 581-618) to an end. But he also completed several great construction projects during his reign, including the Grand Canal and the reconstruction of the Great Wall. 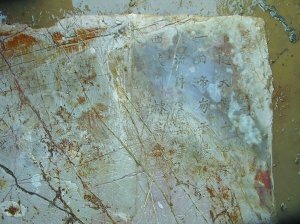 According to Shu Jiaping, director of Yangzhou's archaeological bureau, the inscription on a tablet found in the tomb proves that its owner was Yang. "Yang's tomb wasn't even as luxurious as normal rich people's tombs in the Sui Dynasty, due to his sudden death when he fled revolts to Jiangdu, which is Yangzhou today," Shu said. The tomb is only 4.98 meters long from north to south, and 5.88 meters long from east to west. "Grave robbers had visited the tomb," Shu said. "Also, the roof of the tomb is not in good condition because some residential buildings were built above it." Although the tomb had been robbed, four valuable articles that could be used only by ancient royal family members were found, including lion-shaped door knockers made of gold and iron, and a jade belt decorated with gold. However, according to the local archaeological bureau, no remains or coffin parts have been found yet. The discovery of the tomb turned out to be a happy surprise for people living nearby. 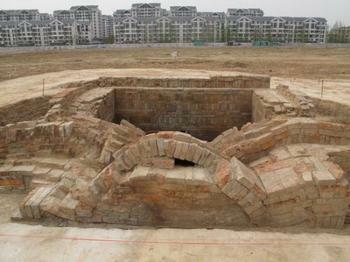 "We heard that construction workers continuously found bricks in the site, which they thought were from normal ancient tombs," said Zhou Jian, a resident. "It never occurred to me that I'm the neighbor of an ancient emperor, even if he was a notorious one." Archaeologists also discovered another tomb nearby, which they say might belong to Yang's queen. The discovery proves that another mausoleum, which is about 6 kilometers from the construction site and has been thought to be Yang's burial site since the Qing Dynasty (1644-1911), is a fake, Shu said. Compared with the tomb discovered, the "fake mausoleum" occupies an area of 30,000 sq m and has magnificent memorial arches, tomb doors and walls. 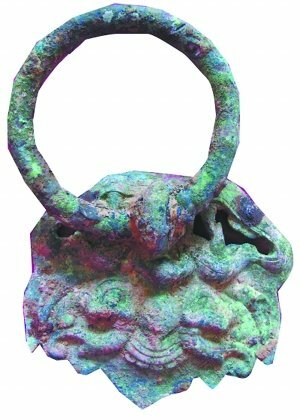 A bronze article found in the tomb of Yang Guang, an emperor of the Sui Dynasty (AD 581-618). An ancient painting of Yang Guang (middle), an emperor of the Sui Dynasty (AD 581-618).